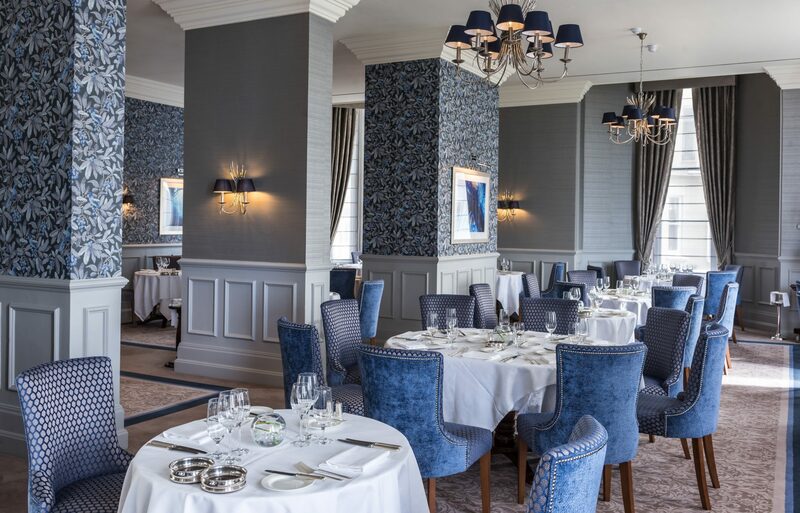 Award-winning Eastbourne restaurant The Mirabelle at The Grand Hotel has reopened following a two-month, £200,000 refurbishment. Already one of the most popular fine-dining restaurants in Eastbourne, the 2-AA Rosette Mirabelle now has a stylish new décor, with a blue, grey and gold colour palette reminiscent of the beachfront landscape directly opposite the restaurant, accentuated with striking new lighting fittings and crisp white table linens. The refurbishment represents a new dawn for the award-winning restaurant, following the appointment of head chef, Stephanie Malvoisin, who joined the team at The Grand in 2017 after three years as head chef at Laura Ashley The Manor Elstree and seven years at The Goring. As part of the refurbishment, the private entrance hallway leading to the Mirabelle has also been redecorated, and the dedicated Mirabelle kitchen received a complete overhaul with a new layout and equipment including the latest induction cookers which will substantially reduce the hotel’s energy usage and carbon footprint. The project work was carried out by local building contractors Cornerstone, with over 1,200 man-hours spent ensuring perfection. General manager of The Grand Hotel, Jonathan Webley, said: “The refurbishment of the Mirabelle restaurant has brought it up to date, with a fresh, modern design that’s still in-keeping with the luxurious and historic grandeur of the rest of the hotel. The new look of the restaurant perfectly complements the exciting menus being created by head chef Stephanie Malvoisin, which put a fresh interpretation on classic dishes. For more information about dining in the Mirabelle Restaurant at The Grand Eastbourne, visit www.grandeastbourne.com/mirabelle-restaurant.